Last week, Wasabi News readers might remember that the Manhole Cover public work had been completed. For over a week the Manhole Cover lay in the ground, unchanged and seemed more like a decoration than anything else. 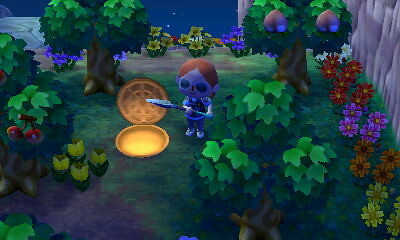 But sometime after 8PM on 5/20, Mayor Neko nearly stumbled down the Manhole! The cover was lifted, and a bright light was emanating from down below. (Anyone having a flashback from the TV show “Lost” right now??) Without knowing what to expect, Mayor Neko cautiously jumped in and headed below ground. 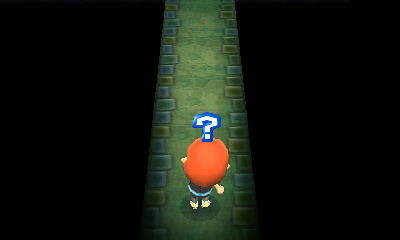 At first, all Mayor Neko found underground was a long and creepy corridor. It was pretty dark, and the Mayor admitted afterwards that she was a bit scared. But curiosity got the best of her, and she walked all the way down the hall to where she assumed the source of the light was located. Mayor Neko was extremely surprised to find what she did. “It was pretty rank down there, between the smell of old pizza and garbage, to that wet mildew odor that sticks to the air underground…” Mayor Neko was quoted as saying to King after her visit. 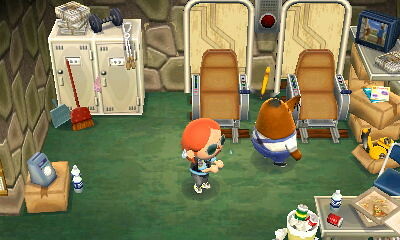 In addition to the garbage, there was an old TV, some chairs, lockers, and of course… Resetti himself! 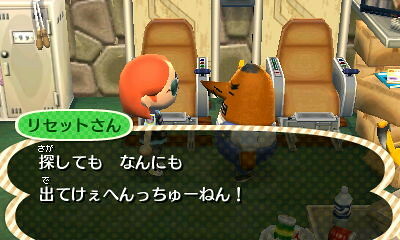 Apparently Mayor Neko had stumbled into Resetti’s Surveillance Center, and the mole in charge was not pleased! Instead of giving the Mayor a proper greeting, Resetti rudely berated Mayor Neko for being where she did not belong. (As the Mayor, shouldn’t she have full access to every part of town?) After angrily ranting to the Mayor, Resetti decided to ignore her and watch his TV until she went away. Before retreating back to the surface, Mayor Neko noticed a small area off to the side of the Surveillance Center. There was a toilet! 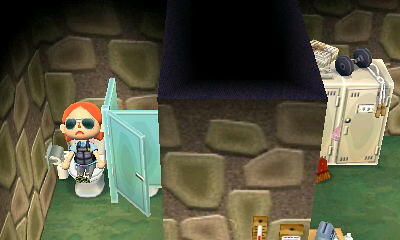 She had to try it out, even though it was a bit unsanitary – she couldn’t close the stall door! The toilet flushed itself when she got up. Gross. Resetti didn’t even mutter a “goodbye” when Mayor Neko walked back down the creepy hallway to leave. Mayor Neko has pledged to speak to Shizue about turning off the cable access in the Surveillance Center. It seemed a lot more like a break room than anything else! Why should Mayor Neko have spent ฿398,000 for Resetti to have a place to watch TV?? Blathers, the curator of the Wasabi Museum, is extremely proud to announce the unveiling of a very famous artwork in the Art Exhibit. 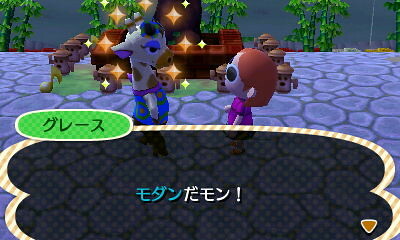 Mayor Neko generously donated a Michaelangelo! 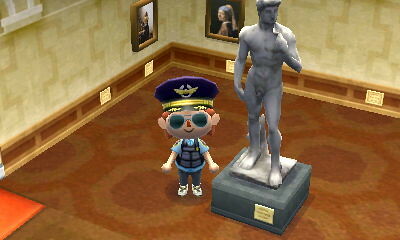 The Statue of David was donated to the Wasabi Museum Art Exhibit on 5/21. This enormous statue was set up in the second room of the Exhibit. It seems the placement is kind of amusing – it looks as though the ladies of the Van Gogh paintings in the background are checking him out! There was even more excitement on 5/21, this time at the Town Plaza. The infamous fashion guru Gracie Grace was standing in the rain, waiting to be judgmental about one thing or another. Mayor Neko asked what the theme was this time, and did her best Japanese sleuthing to determine that the style requested for this visit was Modern. Not sure what to wear, Mayor Neko consulted with her colleague Mayor Yumi to find an outfit that would pass the test. Mayor Yumi helped out Mayor Neko by supplying a “modern ensemble.” All of the clothes and accessories fit the Modern theme – who said they had to match?? 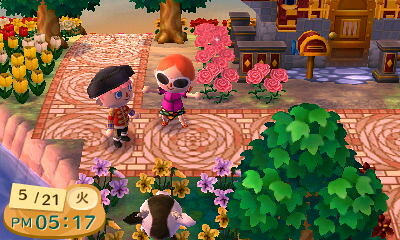 For the record, Mayor Neko wore an Airy Shirt, a Dark Polka Skirt, Ellipse Shades and Sabot shoes. Mayor Neko practiced her modeling technique in Kasen Village (of course Nelson was creepily hovering close by to catch a glimpse!) before heading back to rainy Wasabi to take her fashion exam. 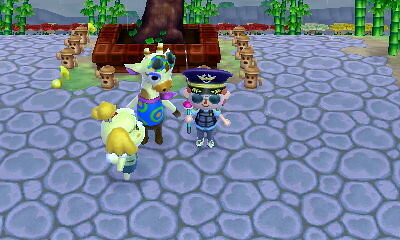 Even though she felt that she looked super silly, Mayor Neko passed the test! Gracie Grace did the usual spin of approval, and handed over a coveted item from the Princess furniture series, which is a Gracie exclusive. 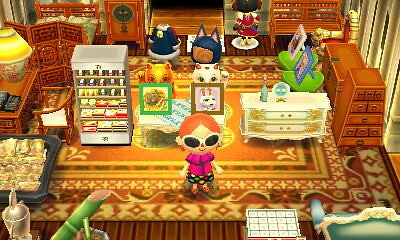 Mayor Neko displayed her new item, the Princess Dresser, in her home, which is quickly filling up and needing more expansions. 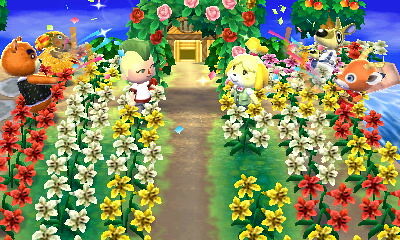 Now Mayor Neko only needs one more successful fashion evaluation before the final upgrade to the Nook Shop will be available! Good luck, Mayor Neko! 5/21 – Big Red Shoe Bench! Currently in the funding stage right now is the Sand Pit, which is expected to be completed by the next issue of Wasabi News. Stay tuned! 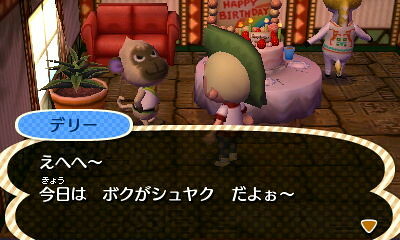 This week, two Wasabi villagers celebrated their birthdays! On 5/22 it was Kitt’s birthday, and 5/24 was Derry’s birthday! Many happy returns to you both! 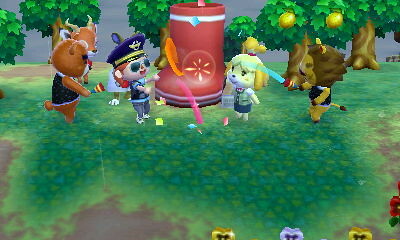 Mayor Neko was in attendance at Derry’s party, but is sad to admit that she kind of forgot to go to Kitt’s party. Sorry Kitt! The time has finally come! Start up your new towns!! Message me on Twitter @gluxbox if you’d like to have a private visit from Mayor Neko! Catch the best bug in town! 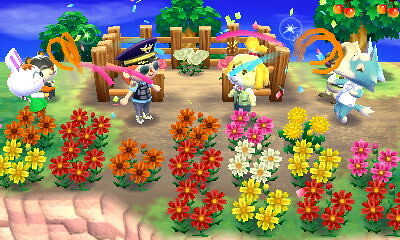 Join Shizue at the Town Plaza to celebrate the coming of summer! Have fun at the Photo Board! Giveaways for all who attend! Love your blog posts — very cute “newspaper” way you do them. I’m very excited for the US version — are you picking up an english version or staying with Japan only? 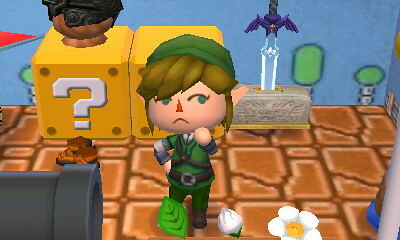 What, no silver shovel? Resetti!!! Very exciting–can’t wait to play!